Publisher started the promo machine for Changers. Indoctrinating the kids into Star Trek. My kids teaching me to catch Pokemon. ONE WEEK until my new book comes out! Finally remembered to take the dry cleaning in. Started working on the Changers sequel again. Helping someone online. Makes me feel good to help people. In turn, that person was very encouraging about my writing. That felt good, too. Introducing the kids to Star Trek in preparation for taking them to the new movie on Saturday. Getting pages of the script written. Support from friends for my upcoming book. The Changers: Manifesting Destiny cover! It's amazing!!! Walking with the kids to and from lunch. Also, lunch. Crazy squirrel outside my office window barking at me. We had a very nice conversation. Sixteen-year-old Cee has a hopeless crush on her best friend Marcus. Unfortunately for her, he's gay. In the wake of Marcus's older brother leaving home to join the Aerie, Marcus has become increasingly distant. Then, when Cee discovers she has a troublesome dragon named Livian living inside her things grow even more complicated. 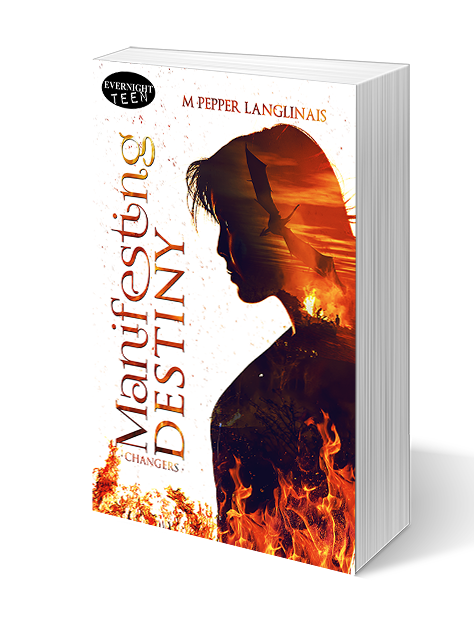 A peek at the concept art for the Changers: Manifesting Destiny cover! Eek! I'm so excited! John Oliver was back. On my DVR because I was out on Sunday night. Took the two youngest to the eye doctor for checkups. All good, no glasses needed (yet). Trip to the local comic book shop. Checking out my aesthetician's new office. Was swank! A release date for my book! August 5. Day out with the family + my 10-year-old's friend. While I didn't think The Secret Life of Pets was anything special, it was still fun. Bonus: Stranger Things. This show is amazing. My 7-year-old daughter wanting to read The Illustrated Man. So we are. Finally got some writing done! Progress on the puzzle I'm doing with my 10-year-old son. The look on my daughter's face when she saw I'd bought her the Upside-Down Magic sequel. Badge ribbons arrived. I'm getting so excited for the conferences! 1-3. Day out in Columbia with the family. Had a really fun time, and the drive was fairly nice as well. Kids really enjoyed panning for gold. We dipped candles and I bought fancy soap . . . and more candles. On the whole a fun family day. Kids receiving their summer reading medals at the library. Orthodontist complimented my zygomatic bones (cheekbones). I was good and didn't snack. My dad called to tell me he's reading my latest novel and loving it. A walk in the hills with my kids. Board games with my kids. But the biggest, most exciting thing today was that I finally landed on the Coming Soon page for Evernight Teen! If they put out one book each Friday, I'm potentially looking at a July 29th release. Yay! New toys for the cat. And there's still one more day left of the weekend! Doing Hidden Pictures with the family. Family show night (wherein we watch shows together: Danger Mouse, Animaniacs, and Peabody and Sherman). Beginning to put together my 4D puzzle of London with the help of my 10-year-old son. Crows. They make me happy. I don't know why. Writing.Chatting with my dad.Perfect weather. Yummy burrito lunch.Swimming.Time with family.